Two weeks ago in Long Beach, the Andretti Autosport Honda’s of Ryan Hunter-Reay and James Hinchcliffe dominated until about 25 laps to go when they both crashed out along with then leader Josef Newgarden of Sarah Fisher Hartman Racing. This crash blocked the whole track in turn 4/5 which took out many cars such as Tony Kanaan, Takuma Sato, Jack Hawksworth and many more. On the restart, Scott Dixon was in command until his engine lead dry with two laps to go given the effective lead to Ed Carpenter Racing’s Mike Conway to go on and win the 40th Toyota Grand Prix of Long Beach. There’s a quick recap of the Long Beach race now onto this weekend’s event in Barber Motorsports Park. 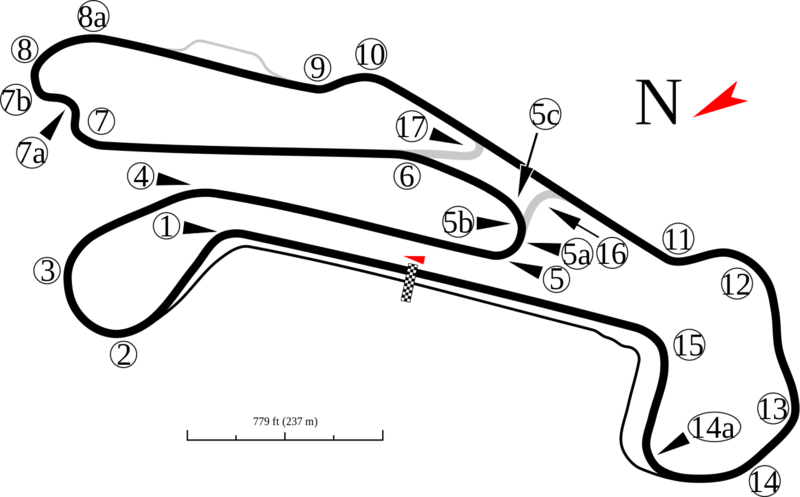 Barber Motorsports Park is a 2.39 mile natural terrain road course with 17 turns located in Leeds, Alabama. BMP first held an IndyCar event back in 2010, which was won by Helio Castroneves. Before Barber became an event on the calendar the track was used for Spring Training testing in 2009 and istill used for Spring Training testing. I have to admit the first time I ever saw Barber, I said to myself “wow, we are racing here? Why not Cleveland or Road America?” The first two races at Barber were snoozefests but since the new chassis the DW12, the racing has drastically improved there. Back in 2012, Will Power started from pole and led every lap. Last year, Ryan Hunter-Reay won from pole but had to fight of Team Penske’s Helio Castroneves and Will Power on strategy. If we see the racing that we’ve seen in the past few years we should be in for a real treat this Sunday. As I mentioned above in the first line of the second paragraph, Barber has 17 turns. Here’s a visual aid to help. The main passing zone on this race course is at Turn 5 and trouble spots are in turns 1 and 7. Passing boldly in turn 5, I expect a lot of front wings being broken considering how much leeway Race Director, Beaux Barfield is giving the drivers this year with contact. I do like the fact that he is doing this because some of the penalties from previous years have been bogus. Juan Montoya, can he continue his momentum from a 4th place finish in Long Beach? I think that JPM can because he was quite quick in Spring Training at BMP and he will be familiar with the circuit. Expect JPM to be in the Firestone Fast 6 come Saturday, I’d put my money on it. Will Jack Hawksworth continue his excellent runs in qualifying and turn them into top 10 or top 5 results. In my mind something has got to give for the young Brit. How will RHR and James Hinchcliffe rebound after the teammates crashed each other in Long Beach. Hinch has said that everything is a okay with him and Hunter-Reay but there still has to be some hard feelings. Conway? Can he make it two in a row? I think if he qualifies good he’s got an excellent chance. First: Will Power, the man has won twice at Barber and if he’s going to finally get a championship this year (wink, wink) Barber is a place where he will need maximum points to extend his 27 point lead over Mike Conway heading into the Month of May and the GP of Indianapolis. Second: Marco Andretti, for Andretti Barber has been up and down for him but I think he bounces back after difficult outings in St. Petersburg and Long Beach. Remember he lost the race back in 2010 on pit strategy and he dominated that race. Third: Juan Montoya, I think this weekend we see the Juan that we’ve all wanted to see this year. With him testing before at Barber and looking quite quick in practice today I think Juan has a great shot to go for a win. The third round this weekend looks like it’ll be anyone’s game it should be a great one to watch. The race will be televised by the NBC Sports Network. Wally Dallenbach, Jr returns to the booth this weekend filling in for Paul Tracy and Jon Beekhuis is back in the lane replacing Marty Snider who is on assignment for TNT’s coverage of the NBA playoffs. IndyCar radio has coverage of every session with Paul Page and Pippa Mann in the booth.